A busy weekend ends and another active week is underway…..
My busy bank holiday long weekend ended yesterday night and today I was back in the thick of things with the second session in another series of felting workshops with Borris Active Retirement. The weather’s been much colder here over the last few days too and unfortunately on Friday evening my Rayburn (large oil fired range) decided to throw a bit of a wobbly and I had to turn it off as I didn’t want to succumb to carbon monoxide poisioning. Anyway, all is well that ends well, it had a service today and now I’m nice and snug again this evening. I am thinking however that I really must hang my usual duvet covers at the front door and study entrance for the wiinter, it’s only going to get colder and draftier from now on and there’s no point in working and living in a cold, drafty house. Jessie was an extremely worthy winner of the Halloween fancy dress at Duckett’s Grove on Sunday (picture of the full outfit on ‘The Courtyard at Duckett’s Grove’ facebook page), here she is paying a visit to my studio just prior to the judging, well done Jessie!!! I did get quite a few new bracelets and chokers made over the weekend, tomorrow I hope to get a clear run with no distractions and have a good, long, satisfying felting day. My plan is to create a whole load of scarves, wish me luck and no distractions please, I really need to knuckle down and get more work felted asap! 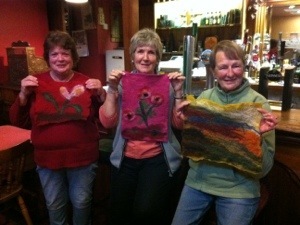 Felting retreat update and pictures from 2 great workshops! I’ve been out of my mind trying to get my paperwork sorted for the accountant, many, many apologies for the lack of blogging this week but I should be back to speed again once I get the next couple of days out of the way! On a happier note, why not treat yourself to an early Christmas present and join Leiko and I at Clasheen for our first joint felting retreat from 13th to 15th November??? 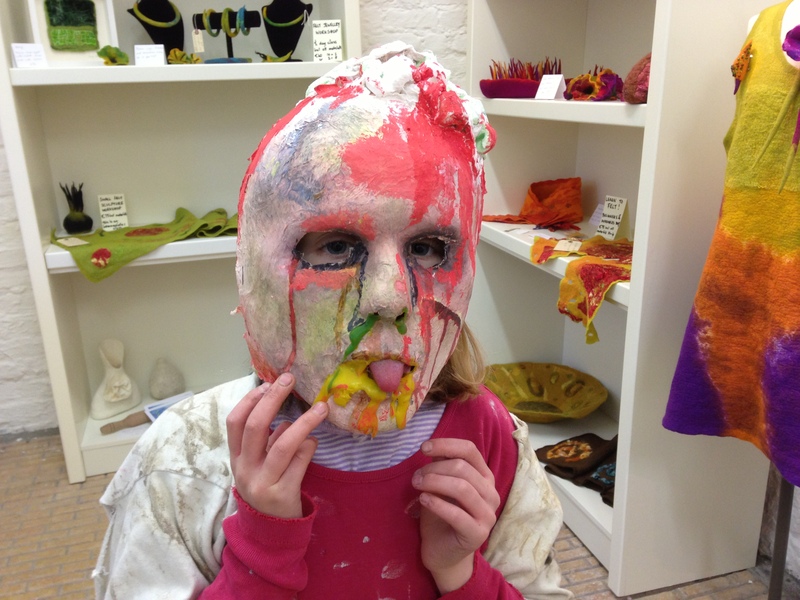 We’re offering a 3 days intensive felting/dyeing/printing workshop, comfortable accomodation and good home cooking with a glass or three of wine for an all in price of E280. If you’d like to participate for two days of tuition and one nights accommodation that will be E200 or alternatively if you’d like to join us for one day of tuition and lunch the price for that will be E90. Participants need to bring their own materials although both of us will have optional supplies for sale at the workshop. 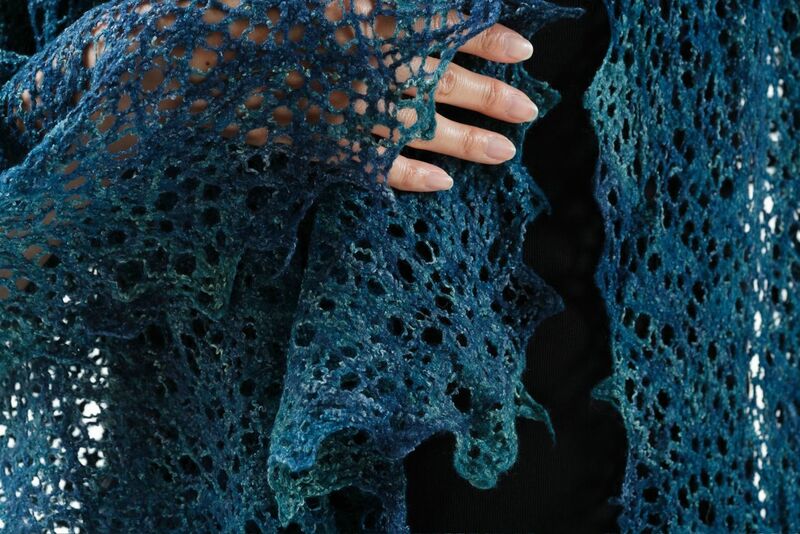 Leiko uses a very fine merino/silk blend which she dyes herself to create her beautiful pine-needle clothing, these pieces have to be seen to be believed! Aside from my paperwork nightmares this week, on Monday Leiko and I participated in a wonderful natural/vegetable dyeing workshop and this morning I facilitated a beginners/improvers flat felting workshop at Clasheen. The dyeing workshop was organised by Carmen and delivered by the fabulous Terry, Terry the Weaver as he is known to many! 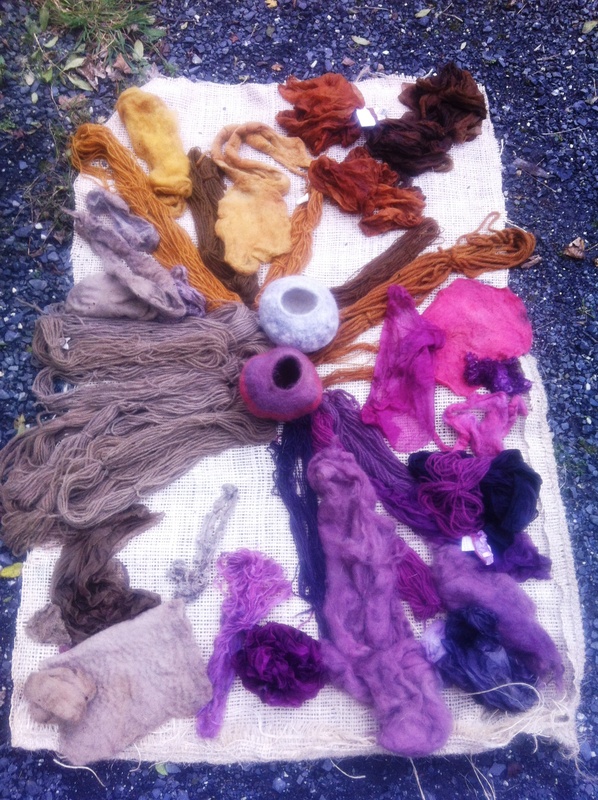 Working with three different mordants (copper sulphate, alum and tin) and three different dye pots (cochineal, onion skins and walnut hulls) we managed to achieve a wonderful variety of toning and contrasting colours on a range of wool, mohair, various other fibres and silk fabric. Carmen also dyed a natural grey wool vessel left behind a long time ago by a student and although I couldn’t get the exact image I wanted from the phone camera here’s a picture of it beside an undyed pot surrounded by all the other glorious colours we achieved! Finally for today’s post, I had great fun this morning teaching the basics of flat felting to Suzanne and her very creative family. She and her two children had felted flowers with me before at a home schoolers session (but missed the introductory, important, explanatory stuff!) 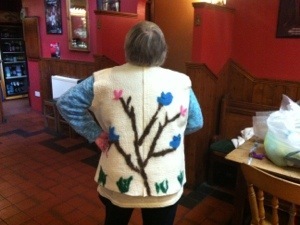 while Geraldine had never felted herself before but loved the flowers that everyone else had made! Anyway, we had a really great session with everyone making really beautiful pieces of high quality felt, check out this picture taken just as it started to rain yet again. 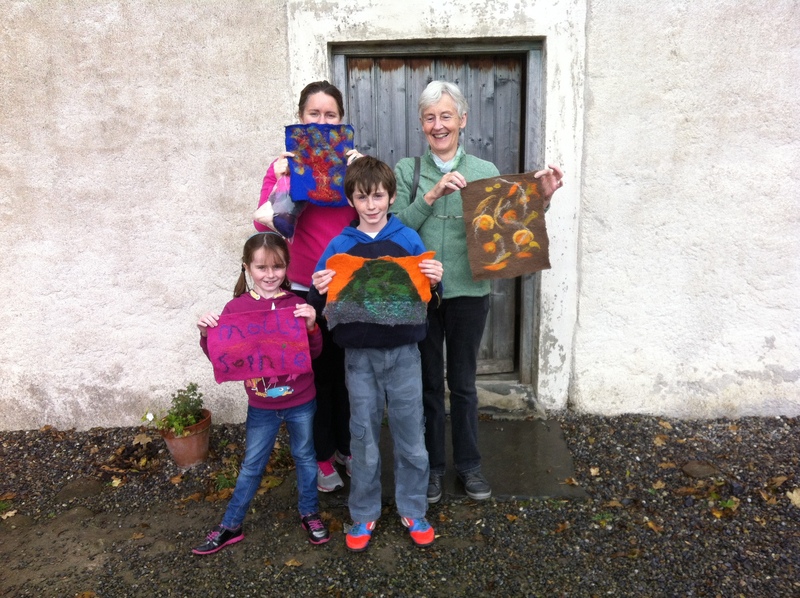 Suzanne, Geraldine, Sophie and Jack with their fantastic first pieces of flat felt! 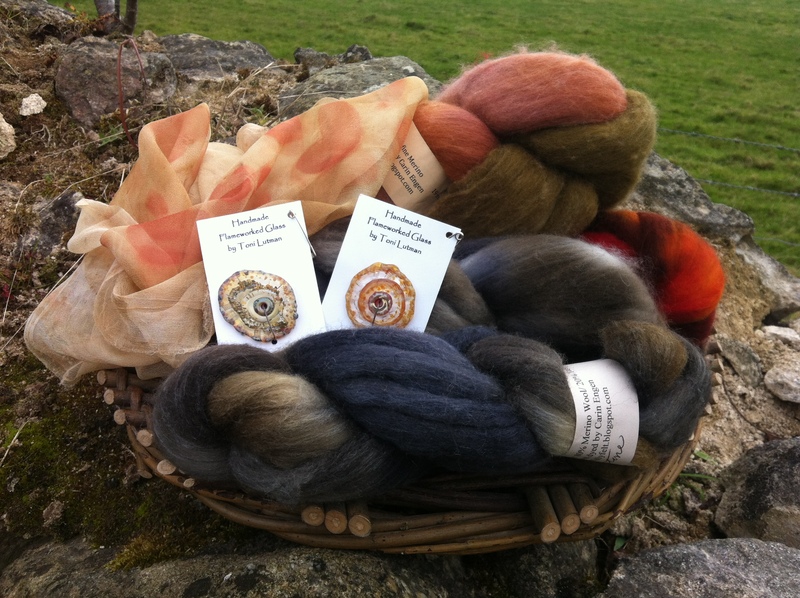 Exciting news – Leiko and I are organising a joint felting retreat at Clasheen! Now that wonderful Japanese felter Leiko Uchiyama has moved next door we’ve started planning a series of workshops to deliver together designed to compliment our individual strengths. Our first three day felting retreat will take place at Clasheen from Tuesday 13th to Thursday 15th November inclusive and this will be the first time in Ireland that Leiko is offering a full workshop to learn her ‘pine needle’ technique! She’ll be teaching this on Tuesday (and Wednesday morning/afternoon for larger projects), I’ll be concentrating on naturally printing/dyeing on Wednesday then felting large nuno wearables and household textiles using the tumble dryer on Thursday, fine felt without fabric or cobweb felt is also an option with this method. The emphasis on all three days will be learning new skills, creating beautifully felted and finished pieces inspired by nature and having fun in a relaxed, peaceful, rural setting. Simple, tasty home cooking will be the order of the day and shared rooms are on site in comfortable farmhouse accommodation! A maximum of 5 residential places are available for the retreat but we will also be able to accommodate a few additional participants for the printing/dyeing day on Wednesday. I’ll post the prices etc. over the next day or two, stupidly I left them at home and I’m now in Duckett’s Grove and felting here for the rest of the day. I’ll leave you with an image of a simple necklace I made this morning. I liked this tiger wire fitting which I bought last year in CA so now need to research the best place to buy these at a competitive price in Ireland. Good news, disappointing news and some beautiful felt too! I’m sorry I didn’t get to blog yesterday. The morning just seemed to rush past and in the afternoon I started a new series of workshops with Borris Active Retirement, Leiko arrived back mid day too and what with one thing and another I never got to fire up the computer at all. I’m now waiting at Duckett’s Grove for one of my US blog readers to arrive (Hi Mary!) and after that I’ll try and pick up a winter jumper (sweater) in Carlow and see if I can find some more props for the studio. The big news I’d like to share with you all today is that I received a call yesterday confirming that my submission for an exciting school arts projects has been selected subject to confirmation of the funding!!! This was the submission that I frantically worked on last week, it’s a fantastic opportunity to work with 480 pupils plus teachers creating 4 large textile panels, felt based but with plenty of other materials too I think! I don’t want to jinx anything at this stage but as soon as we get the financial go ahead I’ll let you know the full details. On the opposite side of things I didn’t have my work selected for the Crafts Council’s upcoming ‘Beauty in Nature’ exhibition. This was a big disappointment but a good lesson not to count my chickens before they’ve hatched! I’ll leave you today with two images, Joan, Mary and Mary with their beautiful first flat felt pictures and Dorothy modelling the amazing sleeveless jacket she felted during our last series of workshops and stitched during the summer. Congratulations ladies! Home, natural dyeing/printing, unexpected presentation taking up my time…..
I’m home safely after a wonderful time in California! It was great to be back at The Tin Thimble catching up with old friends both before, during and after the three days of workshops plus put faces to the friends I’ve previously been in touch with through the blog, FB and various other forms of social media, I’m not going to mention everyone by name but you all know who you are!!! My intention had been to write a long and proper post yesterday about the workshops and my trip with Merridee and Keith to Lake Tahoe, unfortunately I just don’t have the time so apologies in advance to those of you who were expecting all the low down about the exciting work that was created during my three days of teaching. An unexpected opportunity arose while I was away (thanks Paula for getting in touch to alert me!) so yesterday I had to make a presentation in relation to an exciting art project and this morning I got a call asking me to come back in tomorrow and discuss a few of the points raised during this session. Fingers crossed everything will work out, I’ll keep you posted once I know the outcome! As regards other work since I’ve been home I printed two lengths of silk chiffon on Monday evening then last night I filled two pots with silk and leaves in preparation for a natural printing and dyeing session today. One of the pots contained a tea solution, the other a vinegar and water mix. I’ve now bundled everything up and all the pieces are simmering on the Rayburn, most of the bundles contain a variety of eucalyptus leaves but two I wrapped using Cotinus leaves from my garden. I also sprinkled some of the fabric with tea leaves and wrapped one of the pieces in rusty metal, I LOVE opening these bundles, pictures next time, I promise. During my stay in CA I spent time with Merridee, Sharon and Nika Ivanoff experimenting more with this method of colouring fabric, thanks Nika for the wonderful leaves you brought last Saturday for us all to share not to mention the wine, chocolate and strawberries, we loved them all!!! Emma and I are just sorting out dates for workshops in The Tin Thimble again next spring, keep an eye out over the next week or so as we hope to have everything sorted by then! 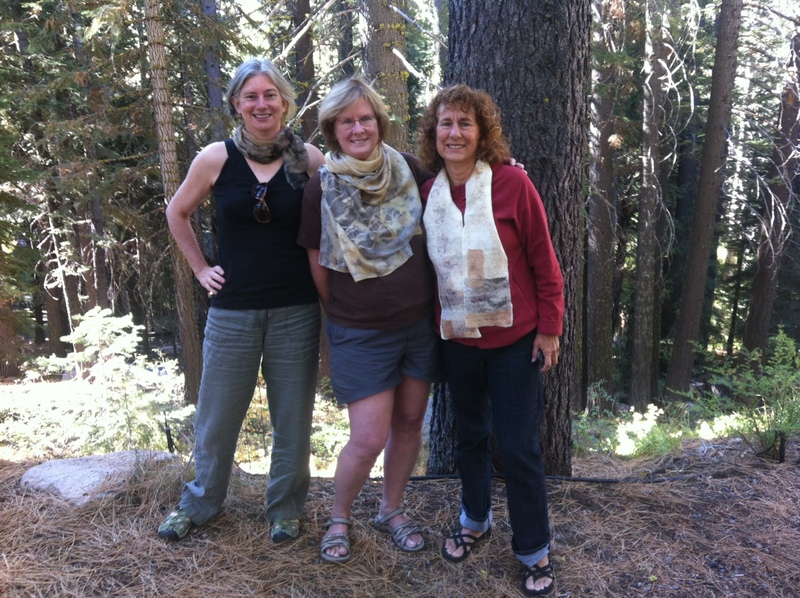 Me, Paula and Merridee wrapped in our naturally dyed scarves! our three days of workshops now on my personal FB page!